JNN 19 June 2014 Baghdad : In a bid to see off the militant offensive, Prime Minister Nouri al-Maliki sacked several top security commanders on Tuesday evening, and then stood alongside several of his main rivals in a rare display of unity among the country’s fractious political leaders. Among those fired was the commander for the northern province of Nineveh, the first region to fall in the onslaught, which began on June 9. Maliki also ordered that one officer face court martial for desertion. The dismissals came after soldiers and police fled en masse as insurgents on Tuesday last week swept into Nineveh’s capital Mosul, a city of two million. Some abandoned their vehicles and uniforms when faced with the insurgents led by the Islamic State of Iraq and the Levant (ISIS), but also including loyalists of now-executed dictator Saddam Hussein. After taking Mosul, militants captured a major chunk of territory stretching towards the capital. Also on Tuesday evening, Maliki appeared on television alongside other senior political leaders, including the premier’s fierce rival, parliament speaker Osama al-Nujaifi. The group issued a joint statement pledging continuous dialogue and promising to preserve the country’s unity. Terrorists pressing a major offensive in Iraq attacked the country’s biggest oil refinery Wednesday, as the prime minister scrambled to regain the initiative by sacking security commanders and reaching out to political rivals. The crisis, which has displaced hundreds of thousands of Iraqis, threatens to carve up the country while the assault on the Baiji oil refinery early Wednesday will likely further spook international oil markets, AFP reported. Terrorists have taken control of most of Baiji in northern Iraq, an official at the refinery said on Wednesday. “The militants have managed to break in to the refinery. Now they are in control of the production units, administration building and four watch towers. This is 75 percent of the refinery,” an official speaking from inside the refinery said. He said clashes continue near the main control room with security forces. 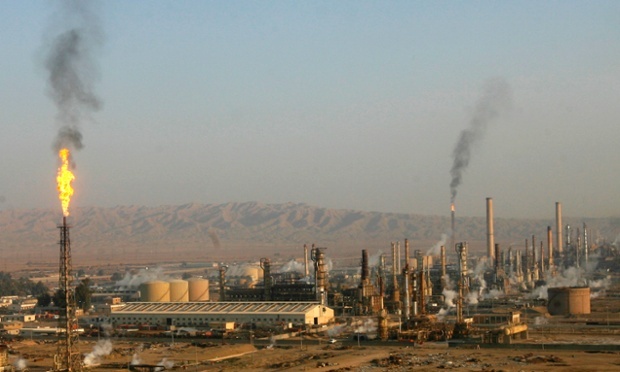 From about 4:00 a.m., clashes erupted at the refinery complex in Salaheddin province, north of Baghdad, according to a senior official and a refinery employee. Some stores of oil products caught fire during the assault on the facility, Iraq’s biggest refinery. Officials said a day earlier that the refinery had been shut down and many employees evacuated because, due to the militant offensive that has seen swathes of northern territory slip from government control, several major cities were no longer being supplied with refined oil products. World oil producers have cautiously watched the unfolding chaos in Iraq, which currently exports around 2.5 million barrels of oil per day, but have thus far stressed that the country’s vast crude supplies are safe – for now. About 60 construction workers from Turkey, Pakistan, Bangladesh, Nepal, and Turkmenistan were abducted by terrorist forces near the Iraqi city of Kirkuk, less than a week after dozens of Turkish nationals were taken hostage in Mosul, according to a news report. Among the 60 kidnapped by militants included 15 Turkish workers who were building a hospital near the town of Dor, located between Salaheddin and Kirkuk, the Dogan News Agency said, citing a worker who escaped. It was not immediately clear when the abductions took place. Meanwhile the Times of India on Tuesday reported that 40 Indian workers were abducted by terrorists in Mosul, with their government saying they have been unable to make contact with them. This entry was posted in Iraq News, Middle East and tagged Attacked, Iraq, Mosul, Nouri al-Maliki, Oil Rifinery, Terrorists. Bookmark the permalink. MALIKI , MAY ALLAH BA WASSEELA E MAULA STRENGTHEN HIS HANDS , HAS TO BE BOLDER, P;UT BEHIND BARS ANY ONE SUSPICIOUS AND BE RUTHLESS IN KILLING ALL TERFRORIST ELEMENT .NO MERCY , SEE HOW THE ZALIM MUNAFEQEEN HAVE TORTURED INNOCENT PEOPLE .